Reno lies 26 miles north of the Nevada state capital, Carson City, and 22 miles north-east of Lake Tahoe in the high desert. 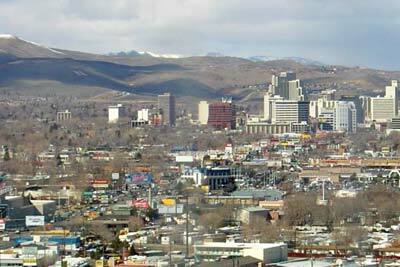 Reno shares its eastern border with the city of Sparks. Reno, known as The Biggest Little City in the World, is famous for its casinos, and is the birthplace of the gaming corporation Harrah's Entertainment. At one time, Reno was the gambling capital of the world. There are several reasons for the decline of tourism in the area, among them the fast rise of Las Vegas, the buying-out of Reno Air by American Airlines and the increase of Indian gaming in California. These developments have shown little impact on Las Vegas, but Northern Nevada has experienced a noticeable drop in business. Downtown casinos like the Comstock and the Sundowner had to shut their doors, while the larger casinos experience slow days during the week. Only during weekends, holidays and special events does Reno see an increase in business. In an effort to bring more tourism to the area, Reno holds several events throughout the year, all of which have been extremely successful. They include Hot August Nights, Street Vibrations, the Reno Rib Cookoff (actually held in Sparks), a Cinco de Mayo celebration, bowling tournaments and the Reno Air Races. The Truckee River runs through town, as does the Union Pacific Railroad, Interstate 80 (east-west) and US 395 (north-south). Reno has an extensive bus system called Citifare, which is provided by the Regional Transportation System of Washoe County. The bus system has its main terminal in downtown Reno and a secondary terminal in Sparks. The city is served by Reno/Tahoe International Airport. The University of Nevada, Reno is the oldest university in the state of Nevada. In 1886, the state university, previously only a preparatory school, moved from Elko in remote northeastern Nevada to a site north of downtown Reno, where it became a full-fledged state college. The university's first building, Morrill Hall, still stands on the historic quad at the campus' southern end. The university grew slowly over the decades but currently has an enrollment of approximately 15,000, most of whom hail from within Nevada. Among its specialties are mining engineering, agriculture, journalism, and the only Basque Studies program in the nation. It also houses the only Judicial college in the nation. Some cultural places are National Automobile Museum, Nevada Historical Society Museum and Nevada Museum of Art.